McGraw-Hill recently published a white paper presenting the results of a survey of more than 1,000 librarians and faculty members to learn more about how each group views the importance of academic libraries. 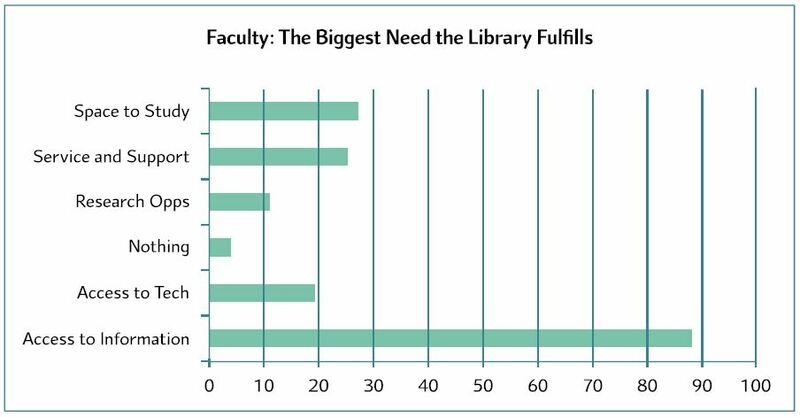 The results reveal a gap between what librarians and faculty view as the most valuable functions of their university library. In the survey, faculty respondents were asked to report their perceptions of how the library is used and those numbers were compared to actual usage statistics reported by librarians. This revealed some large gaps in the way that faculty think the library is being used compared to the librarians’ reality. For example, faculty respondents believed that reference requests occur twice as often as reported by librarians. Conversely, librarians reported twice as many technology requests and double the interest in library programs than perceived by faculty. Librarians also reported 28% more requests for access to materials (e-books, journals, databases, and other resources) than faculty expected. There is also a gap between what library staff and faculty view as the most important need that libraries fulfill on campus. While nearly 9 in 10 (88%) faculty respondents felt that the library’s most important role was offering access to information (online databases, journals, etc. ), less than half (43%) of librarians felt the same. About a third (34%) of librarians responded that access to technology was the biggest need addressed by librarians, while only 1 in 5 (20%) faculty felt the same way. Librarians and faculty did feel similarly about some roles of the academic library: about a quarter of librarians (27%) and faculty (25%) felt that services and programs were among the library’s most important functions, and about 1 in 10 (10% of librarians and 11% of faculty) felt that providing research opportunities was the library’s most important function. The entire report and corresponding infographic contain a wealth of information about the perceptions of academic libraries. This information can help librarians determine what makes their libraries valuable to other groups on campus, which is useful when negotiating a budget and planning for the future of the library.